1. I figured out how that I must be getting close to retirement because people have begun asking when I plan to retire. 2. 50 degree days seem a lot colder after spending a week on vacation with temperatures in the high 70's and up to the 90's. 3. Wine is agriculture and unseasonably cold temperatures can destroy a whole crop. 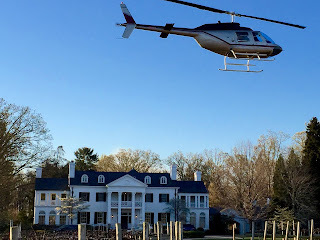 This weekend while I was visiting Charlottesville, the vineyards were using extreme measures to save the vines from the cold--burning hay, flying helicopters to move the air, and employing uniquely designed flame throwing machines to warm the air between the rows of vines. 4. The quote: "Winning isn't everything, it's the only thing" took on a new meaning this weekend. By the way, I always thought I was quoting Vince Lombardi, but it turns out that UCLA Bruins football coach Red Sanders is the originator of the phrase. 5. The political landscape remains in complete upheaval. The conventions this summer should be a lot of fun. 6. The Orioles are the only undefeated team in all of Major League Baseball at 5-0. 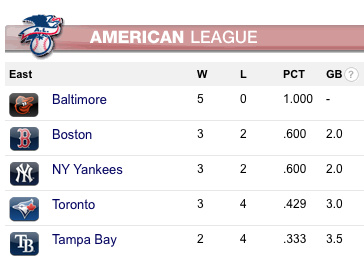 They tied for best start of the season by any Orioles team yesterday with a win. The last, and only, time the Orioles started 5-0 was 1970 and they won the World Series that year! 7. Yesterday's Master's finale showed how the fortunes of golf can turn in just a few holes. Congratulations to Danny Willett for a solid performance. Condolences to Jordan Spieth but also congratulations for his accomplishments. 8. It doesn't matter of you come in 2nd or 11th--you still lost and that is a hard pill to swallow. 9. One week to Tax Day--are you ready?